A community garden was organized and started in 2008. The plots are 10x20 and the cost is $10 each, one plot per person. Once a plot has been assigned to everyone who has signed up, more may become available. Gardening is the second-most popular recreational activity in America. It is a great source of exercise and also allows people to provide healthy, fresh food for themselves and their families. The number one reason people give for not gardening in Glendive is deer. The number three reason given is the high cost of water. Through grant funds received from the Montana Department of Agriculture and the Northwest Area Foundation, Dawson County Extension, in conjunction with Community Giving Assistance Towards Employment's (GATE) Farm-to-Table Project (FFT), provided both novice and expert gardeners a deer-proof gardening location with free water. More than 45 people participated in the community garden by utilizing one or more of the 121 10'x20' plots to provide local, fresh food for their families and the community. Hoses and gardening tools were provided for participants if they did not have their own. A loader tractor with a rototiller was borrowed from the county correctional facility to work up the plots. Dawson County Extension has worked with the county's correctional facility in developing their own gardening program to provide more fresh, nutritious food for its inmates. Through this program, local residents have been able to increase their amount of outside activity while providing their families with nutritious, low-cost fresh vegetables. Participants have been able to "learn by doing" and have increased their knowledge of a valuable life skill. 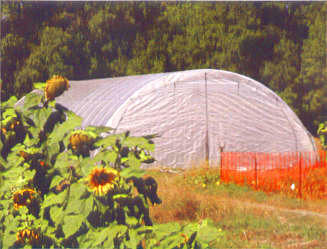 Through a Montana Department of Agriculture Growth through Agriculture Grant, a two-year high tunnel production system grant concluded in 2009. Because of the tentative success of the project, a three-year, movable high tunnel project proposal was written and has been funded through a USDA Specialty Crops Program Grant. A 30'x72' tunnel at the community garden and another 30'x96' tunnel at the county correctional facility have been in operation the last two years. The two projects differ in that the two new 30'x96' tunnels will be constructed so that they can be moved, all in one piece, at least twice a year. The project is designed to determine how much product can be produced, how long we can extend the growing season, and if moveable tunnels are more efficient and more profitable than a fixed-tunnel system. 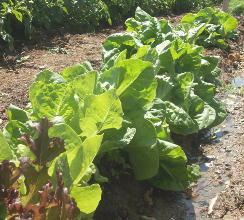 One of the season-extending theories to be tested is the production of vegetables through the winter season without added heat. The tunnel at the community garden was planted in early October with several types of leafy greens to test the feasibility of this concept. The development of these types of growing systems would allow producers and communities across the northern part of the United States the ability to replace some of the food currently being shipped into the region with fresh, locally-grown produce. By adding to the income of local producers and providing an additional source of local food, producers and local communities will become more sustainable and economically viable.